Move over, Portland and watch out, San Francisco. There’s a new American Bike City on the horizon and she’s closing in fast. When we think about bicycling in urban environments, we are not accustomed to looking south. The Memphis evolution and the commitment of Mayor A.C. Wharton started to change that perception. New Orleans boasts a lot of people on bikes and Florida is dipping its toe in the waters of bike friendliness. 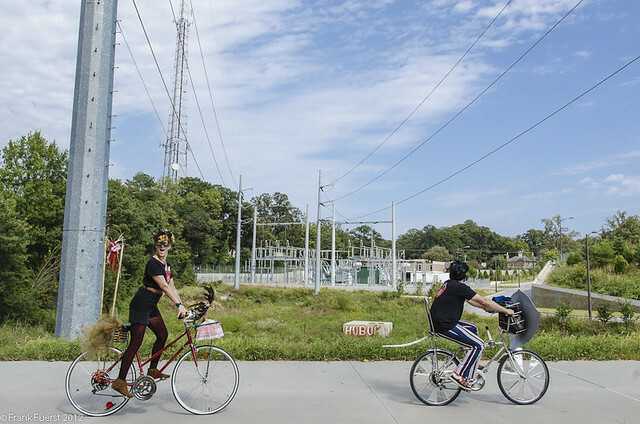 Now Atlanta is stepping up its game with events and initiatives that match a solid regional investment in active transportation. Not just a multi-use connector path, this transformative project is a network of parks, trails, and transit that will circle the downtown area and connect 45 neighborhoods. The U.S. Department of Transportation gave it a big thumbs up in September when they awarded the project an $18 million TIGER grant — the single largest grant in the recent round of funding. Four segments are already open with more coming soon. 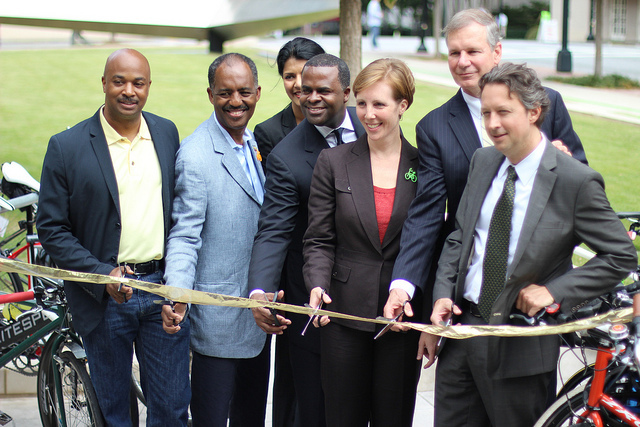 When Kasim Reed took office in 2010, he wasn’t a bike guy. And maybe he still isn’t. But I’m guessing he’s been paying attention to other big city mayors like Rahm Emanuel and Mike McGinn and sees that a city that is inviting to people on bicycles and on foot is a city where people and employers want to be. 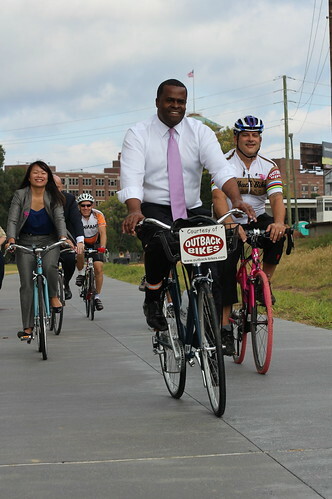 In the last year, Mayor Reed led the City to approving $2.5 million for bicycle facilities, funded Atlanta Streets Alive!, the city’s open streets event, for the first time ever to the tune of $50,000, and promised to double the city’s miles of bike lanes by 2016. That’s a darn good start. The first open streets days in 2010 drew a few thousand people, hitting the golden 20,000 attendee mark in 2012. 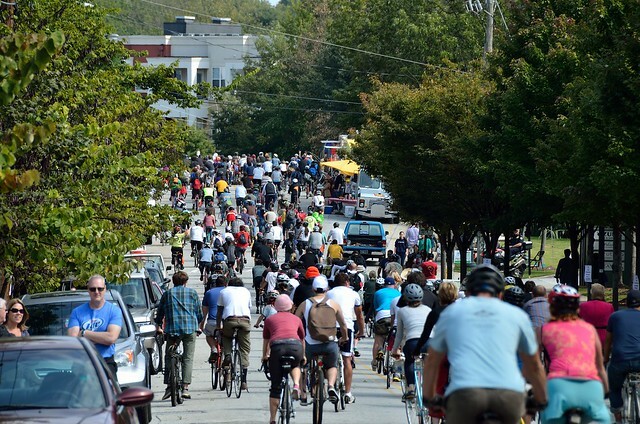 Then the Atlanta Bicycle Coalition got this wild idea of holding Atlanta Streets Alive! on Peachtree Street, Atlanta’s main thoroughfare. The City agreed and gave them a permit. Well, whaddya know? On September 8th, 2013, 50,000 people showed up to walk, bike, rollerblade, skateboard and otherwise move along this signature city street. A month later, 82,000 people came out for the same good time on Highland Avenue. Who knew? It’s like they think they’re in LA! 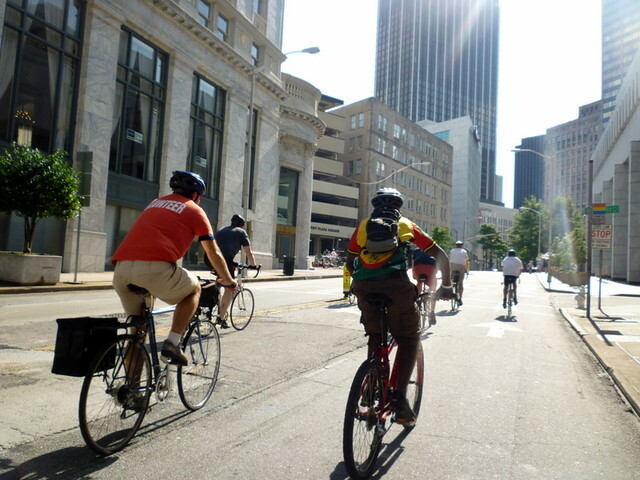 We’re giving a little shout out to our friends at the Atlanta Bicycle Coalition because we think they’re rockin’ it. When we gave them a grant a few years ago to join Georgia Tech, the City of Atlanta, and the Midtown Alliance in redesigning a section of road near GT to make it safer for bikes, we were delighted with the outcome. Now we are supporting them again with funding for an advocacy project that will transform three key Atlanta corridors by adding conventional and protected bike lanes. They turned our challenge of building business support into an opportunity and formed partnerships on this project with Ponce Street Market and MailChimp. They are working with the City of Atlanta to submit a strong application to become one of our Green Lane Project’s focus cities. And they’re doing it without a big staff or a big budget. Go ABC! Where will Atlanta go next? I don’t know for sure. But I’m looking forward to finding out.